Pranayan - Collection Of Tribal Paintings By Narmada Prasad Tekam is an event that took place between 09-Feb-2007 and 15-Feb-2007 in Hyderabad. The world, someone said, is full of tribals. We don't know who said it or if he indeed said it, but he must have been misquoted. The correct statement is, the world is full according to tribals. And here is a bunch of paintings that they've to show just how full the world is. 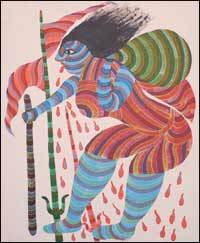 An exhibition of tribal paintings by Narmada Prasad Tekam is on view at Le Cafe D'Art. It is being organised by The Adivasi Lok Kala & Tulsi Sahitya Academy of Bhopal, Madhya Pradesh, in collaboration with Chitramayee State Gallery of Fine Arts and Kalahita Art Foundation. Narmada Prasad is a tribal artist from the Gond tribe. He has been conferred upon Shikhar Sanman, the highest award by the Government of Madhya Pradesh, for 2005. His paintings adore the walls of many government establishments, including the Reserve Bank of India, Bhopal. Tribal art is an impulsive expression owing to the experience of being in nature and that of natural living. Although ritual practice takes up a key role, life for tribals still is closely linked to food, well-being, health and survival. The uninhibited stylization of each tribal art form is essentially colorful and vibrant, and redolent with the natural expression of people that derives from this. In the Gonds' belief, trees stand central to life, and the spirit of many things lie in them. They are full of activity all day, giving shade, support, shelter and food to all. Only during the night so they have time for rest. Contemporary life is also expressed through simply stylized forms. The use of natural colors in the shades of ochre, coal, indigo, chalk etc. instills sublimity to these paintings. Gond paintings offer variety unlike other tribal art forms. The tribal exhibition of paintings is also being showcased at the State Gallery of Fine Arts and the Kalahita Art Foundation, till 17th February. For further details, please contact 6650-6661. Be the first to comment on Pranayan - Collection Of Tribal Paintings By Narmada Prasad Tekam! Just use the simple form below. fullhyd.com has 700,000+ monthly visits. Tell Hyderabad what you feel about Pranayan - Collection Of Tribal Paintings By Narmada Prasad Tekam!